I know a bank where the wild thyme blows. Ken Ludwig kicks off his book, How to Teach Your Children Shakespeare, with the first line from the bard’s comedy, A Midsummer Night’s Dream. 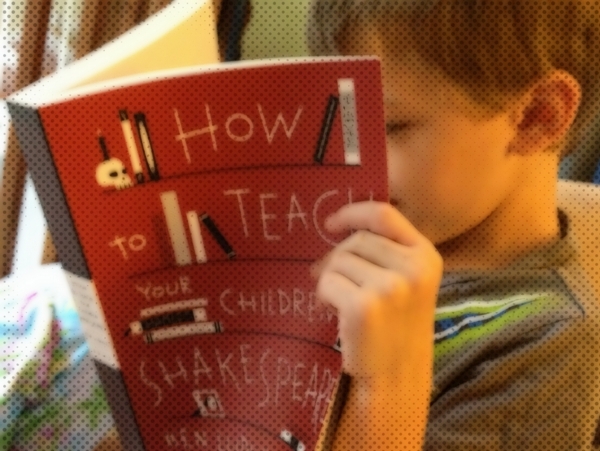 From the very start Ludwig emphasizes the book’s approach, that is to get kids (and parents) memorizing Shakespeare. The author rightfully compares the work of Old Bill with the King James translation of the Bible for its influence on Western culture. It would be very hard to overstate this influence, which can be found everywhere, once you know where to look. As a former English major, I have fond memories of reading Shakespeare’s plays and poetry. The best part of the classroom experience was that we were walked through each play by a knowledgeable guide—someone who pointed out the highlights and made sure we didn’t miss any golden nuggets. So far, we’re only a couple chapters into the book, and Grace and (to some extent) Tater are starting to get into it. Check back for updates on our progress!